The UN has denied that weapons found on a cargo ship seized by Kenyan authorities at the port of Mombasa were being transported illegally. 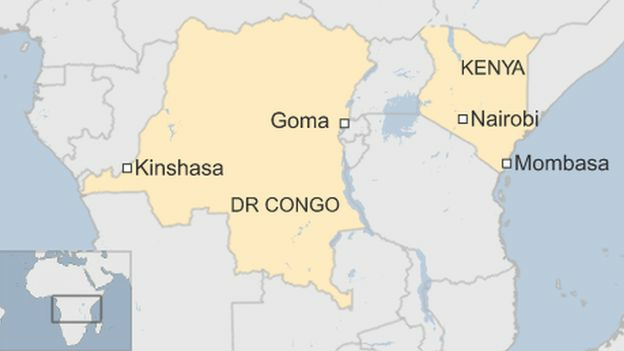 It says they were part of a legitimate consignment for its peace mission in the Democratic Republic of Congo. Both Kenyan authorities and the ship's Norwegian owners have said that the weapons were not declared. The UN is awaiting the outcome of drugs tests by Kenyan police on a substance found around some of the vehicles. It has also criticised Kenyan authorities for breaking protocols by inspecting the ship's cargo in their absence. The vehicles and weapons on the ship, which were loaded in the Indian port of Mumbai, were destined for an Indian battalion of the UN's mission in DR Congo (Monusco), the UN says. Rifles and rocket-propelled grenades were among the weapons found on board, Mombasa police chief Francis Wanjohi told media last week. Monusco is one of the UN's biggest peacekeeping operations, with nearly 20,000 personnel. The ship is still being held in port, a week after elite Kenyan police units launched a surprise midnight raid on the vessel. Among those involved in the raid were members of Kenya's anti-narcotics squad. The suspicious white powder which Kenyan police found near UN vehicles on the ship may have been "anti-humidity powder that's put around tyres for long shipments", UN spokesman Stephane Dujarric said on Thursday. It was "normal practice" for weapons to be placed inside the vehicles to avoid them being damaged in transit, Mr Dujarric added, saying that a "clerical error" appeared to be behind the "misunderstanding" over the weapons' declaration. Hoegh Autoliners, the owners of the ship, have issued a statement describing the incident as a "violation with our terms of transportation, which clearly states that no arms or ammunition are accepted for shipment". Last month, Kenyan authorities blew up a yacht off the coast of Mombasa, after heroin worth $290,000 (£185,000) was found on board.